60, Jalan Penyair U1/44, Temasya Industrial Park, 40150 Shah Alam, Selangor, Malaysia. 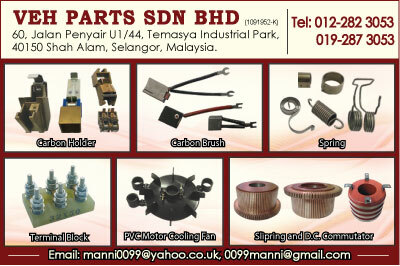 VEH PARTS SDN.BHD. have been established for almost 20 years. With years of experiance in the carbon holders , we uses the latest CNC machinery to make most of our holders.At present we are located at No 60 Jalan Penyair U1/44 , Temasya Industrial Park , Shah Alam. Selangor , Malaysia , Our holders are made and check according to International Electrical Standard.